Besides the fact that Hand Piecing is where it all began, there are several reasons to become adept at hand piecing. It is portable. 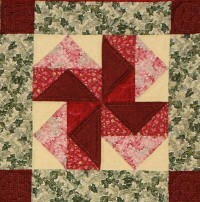 Hand Piecing can be done anywhere that a needle and thread can be used. You don’t have to sit at a sewing machine or have an iron handy. The technique is basic to the core, slow and therefore very relaxing. The results are charming and very satisfying. The equipment list can be as basic as you want it to be. A block pattern and a color scheme. There are a bazillion quilt block patterns out there and always the option to create your own. Personally I like the traditional blocks – they make me feel closer to the women who used them to cover their families from the chilly nights. The one pictured is usually called Duchman’s Puzzle. Each block has its own elements which require each different piece to have its own pattern (plastic or cardboard) or dimensions and instructions to rotary cut. Patterns and rotary cutting dimensions should including the ¼ inch seam allowance. Fabric – 100% Cotton is traditional and is easy to work with as it holds its shape and takes a crease well. Sewing needles (some quilters use quilting betweens to piece. It is a good way to get the feel of a between before trying to hand quilt). Betweens are short, stout and sharp but any needle you are comfortable using is great. A good quality cotton sewing thread. You do not want to use quilting thread to piece. Regular cotton sewing thread is strong and does not take up any extra room in the seam allowance. This makes for a nice crisp seam. A single strand of thread is used – do not double it. Good fabric shears and small scissors for cutting thread. Today, most quilters use a rotary cutter for cutting pieces. I learned with scissors and plastic pattern pieces. No rotary mat required, only a piece of fine sandpaper to hold the fabric while you mark it. Marking pencils and a ruler with ¼ inch marks along its length – a quilter’s ruler is perfect. I use a very sharp regular pencil on medium and light fabrics and a yellow pencil on dark fabrics. It is very important to be able to see the marked lines and corner dots easily. Marking lines are drawn on the back of the fabric as the piecing is done with right sides together. Trace around your plastic pattern pieces and cut out each piece from the specified fabric or using dimensions and a rotary cutter. Note: Be sure that odd shaped pieces which are mirror imaged are being cut so that they face the correct way when assembled into the patch. Do not use selvage edges as they do not always lay flat. Your pattern pieces or rotary cut dimensions included the ¼ inch seam allowance. Now those allowances need to be marked as these are your sewing lines. Make nice dots at the intersection of the lines at the corners. Rotary cutting and machine piecing using a quarter inch foot on your sewing machine is very fast, but we are looking for slow and quiet. Take your time and lay each piece right side down on the sandpaper and using your ruler draw lines a quarter inch from the edge of the fabric and dots at the corners. Try to keep your pencil sharp so that the lines do not get progressively fatter. If you can’t stand the slow pace of this method, write to me and I will give you my slightly faster method. I think that it is important to try this way first because it gives you the opportunity to really get to know your ¼ inch seam allowance. After a while, you will instinctively know when you are off course. In my first quilting class we used finished size patterns and drew the ¼ inch lines around them before cutting out the pieces. I found this very tedious but effective. Try it yourself. Note: Finished size does not include a seam allowance. Construction – Sewing the pieces into patches and then blocks. The pieces are joined with cotton sewing thread, right sides together. A medium gray thread works really well with all colors both light and dark for piecing. You will be using the same thread throughout the piecing project. The stitch used is a very simple running stitch (———–) how easy is that! Using a single thread and keeping your stitches fairly small, stitch from corner dots across to the corner dots checking on the back to make sure you are sewing on both lines. Pinning the end dots can be helpful but be sure not to skew the lines. Pins should be at a right angle to the sewing line. At the end you can fasten off the thread and cut it or take a couple of back stitches and continue on with the next piece. Now and then you can take a back stitch in the middle of a line which will help the pieces from coming completely apart if the thread breaks later on in your quilt’s life. This will make a nice strong seam. When you have finished assembling the pieces into patches, finger press the seams to one side. (General rule is press to the darker fabric so there is no shadowing of dark fabric through light colors.) Quilt seams are almost never pressed open as in garment sewing. Note: When you reach a corner and you are going to attach another piece, be sure you match and stitch through the dots – do not catch any of the seam allowances in your stitches. The little points at the corners should be free to flare around like a pinwheel. By stitching the dots exactly you will be able to piece the Dreaded Y seam with ease – unlike on a sewing machine. Pieced Quilts are constructed in Blocks which contain Patches usually in combinations of threes or fours. Hence the Three Patch Block, Four Patch, Six and so on. The Patches are the small elements that create the Block. Each Patch is constructed or in some cases it is a single element, and it is then joined to the next patch across the row. Most patches make squares or rectangles that join easily with each other patch to make a row. As each row is completed it is set aside until all the rows for the block are complete. Using a square of Styrofoam covered with a piece of cotton flannel works great to keep each piece in its proper place until the block is finished. The rows are then joined making sure that seams match exactly until the block is complete. Blocks are joined in rows and rows are joined to complete the pieced quilt top. Start small and simple and have fun.